We spent our first few days in Dublin, but today I will feature Galway. I still need to sort out the photos I took in Dublin. Procrastination is my enemy these days. Off note, I've been feeling lazy since we got back from vacation. I'm in a weird phase. I'm not sure if it's the stifling summer heat or something else. The DC Metro area feels like an oven at this time of year. Otherwise, I'm in need of some motivation. Perhaps another vacation? Oh how I wish! Our first day in Galway was subtle and laid back. Right after we checked-in at our bed and breakfast, we parked our rental car and walked to town. The weather was also beautiful but little did we know the next day will be windy and rainy. I'm not sure what game they were playing, but it looked like basketball on water with canoes. We watched them for a long time trying to figure out what game this was. Does anyone know this game? 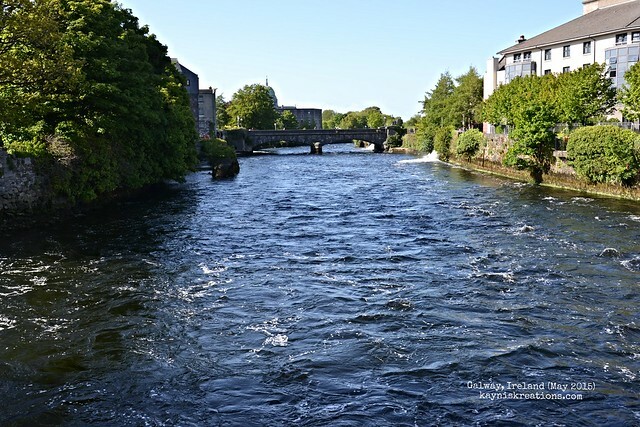 The River Corrib - photo taken from the Wolfe Tone Bridge. This is where the River Corrib meets the Atlantic Sea. 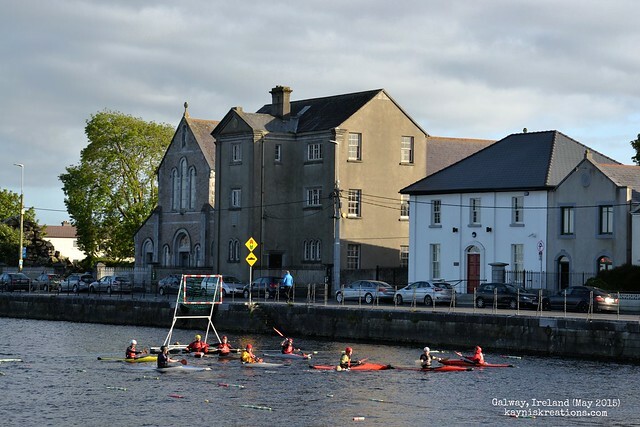 This is one of my favorite photos because it captures Galway's beginnings as a small fishing village. Today, you can still watch salmon fishermen haul their catch for the day at sundown. The sea and the weather are crucial in defining the land and people of this area of Ireland. Wonderful images from your Ireland trip! It is on my wish list! Did you like driving the rental car, I was thinking about the B&B Ireland trips. I am just scared to drive on the wrong side of the road, lol! Have a happy weekend! Driving on the wrong side of the road is quite interesting. My husband did all the driving and we've been beeped at so many times for driving on the "right" side. If you're not up for driving there, do the tours. Did you get an automatic car? All the research I'm doing says the manual car is the norm there and the additional fee for automatic car is way too much. Oh I cannot wait to see all of the photos. It's nice out here, warm, but not scorching. We can't have that when we are also dealing with drought. We got a manual car. My husband wanted to switch it to an automatic but it was an additional 35 euros a day. It was too expensive. But, my husband got used to driving on the wrong side after 11 days...lol. Ha ha ha, very funny! It actually would not have been that bad if it is wasn't for the gear shift being on my left-hand, the narrow roads, listening to the GPS and those freakin' round-abouts. I enjoyed the challenge actually. For all the challenges of driving on the "wrong" side of the road, it was totally worth it and I can't wait to go back. And as for Automatic vs Manual, if you know how to drive a Manual, I totally recommend it, it just adds to the overall experience. I would wish to travel in Ireland in the future. Thanks for sharing. Anyone who posts photos of Ireland, a country I LOVE to visit, can always count on a visit from me! Thank you! I think you have captured the area for me. Beautiful photos. Lovely place! 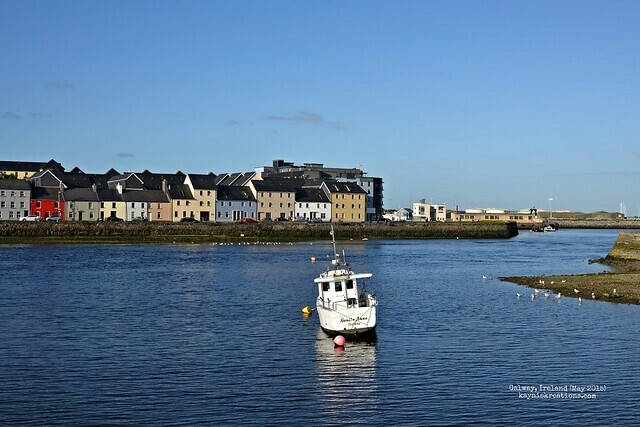 Galway is a nice sounding name … medieval with a bit of Irish wonder in it. The beautiful water is very appealing to me, we love hanging out in watery places. I am always overwhelmed by too many pictures. The blessing and the curse of a digital camera is the same thing ... You can take as many pictures as you want. Beautiful photos. I would love to move to a place like Ireland or Scotland, where the summers are cool and there are days of rain. Too much sun can be so stifling to the senses. The canoe sport looks like water polo to me. Amazing clicks Kayni...i particularly liked the last one with so much blue up in the sky and down in the river. I guess it was a sunny day. Lovely photos, brings back some sweet memories! If you take the ferry out from Galway you can see the beautiful Aran islands too. Galway is a beautiful city though - nice town centre and lots to do there. no worries, you live life one day at a time, so post whenever you feel like it.